“In May of 2010, we had a flood that caused the land to slide a bit. We had debris in the roadway and it looked like there was high potential for it to happen again,” explained David Filliatreau, Staff Engineer with the Kentucky Transportation Cabinet. Initially, the Transportation Cabinet considered poured-in-place concrete retaining walls to repair the slopes. But the aesthetics of a concrete wall just wasn’t right for the cemetery setting. In addition, because the retaining walls needed to be built so close to grave sites, minimizing the excavation and reinforcement required was a major priority for the project. “If we dug too far into the hillside, we would have had issues,” Filliatreau explained. The KY Transportation Cabinet first heard about Redi-Rock® in a presentation from local Redi-Rock manufacturer and retailer, Redi-Rock of Kentuckiana. “When we learned about Redi-Rock, my boss said, ‘This could be a great product for the slide repair in Montgomery County,'” Filliatreau said. Aesthetics: Aesthetics was a major concern for the project. Since it’s in such a high visibility area, the design needed to be sensitive to the cemetery’s aesthetics. Redi-Rock’s Cobblestone texture proved to be the best choice for the project. “A plain concrete wall just wouldn’t have worked here,” Filliatreau said. Minimized Excavation: “The advantage of using a gravity system is that we only had to excavate 7-8 feet (2.1-2.4 meters)back into the slope so we didn’t disturb this sensitive site,” Filliatreau said. The massive block size of each one-ton Redi-Rock block allows tall gravity walls to be built without geogrid reinforcement in many applications. Cost: A gravity wall design translates into minimized excavation and installation time-and also a cost savings as compared to other more labor-intensive systems. “With Redi-Rock, we get the aesthetic advantages but it also came at a lower cost to tax payers,” Filliatreau said. 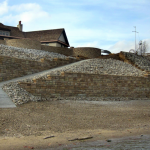 “We’d never done anything like this; we’re used to doing gabion basket walls which require doing a lot of work by hand. The Redi-Rock walls only take one person on the ground and one person in the excavator, so it frees up other people to do other work. This was easier and faster than installing gabion baskets,” said Charles Barnes, project foreman. “Once the crew was comfortable with installing Redi-Rock, the walls went up like clockwork. They love the system,” Fassler said. To create a gravity solution for this project, engineers specified three unique types of Redi-Rock blocks: 41 inch (1030 millimeter) blocks, 9 Inch (230 millimeter) Setback blocks, and corner blocks. Redi-Rock 41 inch (1030 millimeter) blocks (measured from face to rear) make up the majority of the walls. These blocks weigh 2309 pounds (1047 kilograms), as much as a Budweiser Clydesdale. Each Redi-Rock block has a knob and groove design, which means the blocks stack up like giant, 1-ton Lego blocks. “On one side of the road, we also incorporated a course of 9 Inch (230 millimeter) Setback blocks because of the top slope load,” explained Fassler. 9 inch (230 millimeter) Setback blocks are used to increase the batter angle of a wall and allow taller gravity walls to be built. Redi-Rock corner blocks were used as step downs as the wall transitioned down the slope. “When you’re stepping down a slope, using corner blocks is a good way of capturing that slope. The corner blocks kind of act as speed bumps for water runoff,” Fassler said. By creating a Redi-Rock gravity solution with superior aesthetics and simple installation, the Transportation Cabinet was able to repair this sensitive erosion issue in a quick, cost efficient manner. Cobblestone Texture Blocks – Redi-Rock Cobblestone blocks feature a great stacked stone aesthetic with the appearance of six smaller blocks.